AMR’s Seattle EMT pay is miserable compared to all of these areas. Plus, according to Sawant’s office their healthcare plan is substandard — not a desirable thing for a group of people who witness trauma on a daily basis. If the average pay for EMT’s in Seattle is so high (actually, the highest in the nation, according to the BLS) then why is it so low for AMR? Because the company has “market power” — out of the 1190 EMTs in the greater Seattle metropolitan area, it employs 430 of them. Nevertheless, AMR is violating its contract with the city; it is not offering a compensation package that is substantially equivalent to similar areas of the country. But the City of Seattle has not taken steps to enforce that provision of its contract with AMR. AMR’s Seattle EMTs are represented by Teamsters Local 763, which is in the process of negotiating a new contract with AMR. Sawant’s resolution requests that the city carry forward into the new contract it is negotiating the same provision requiring a competitive compensation package for its EMTs, but also specifies that the rate should be no less than $25 per hour, and the benefits package should be comparable to Seattle Fire Department workers. It also requests that the executive branch provide the City Council with a draft of the new contract it negotiates with AMR before approval before it is executed. Sawant’s intent was to introduce and pass the resolution this afternoon. However, today SFP Chief Harold Scoggins, who apparently hadn’t seen the bill before this morning and whose staff is negotiating the new contract with AMR, asked several Council members to hold the bill to understand the issues, including budget implications. AMR isn’t simply going to absorb a $10/hour increase in wages; that largely will get passed through to the city. The other Council members expressed their general support for the resolution, but most of them wanted more time to work it through. Gonzalez, whose committee oversees public safety, wanted to give Scoggins the change to provide input. Herbold noted that AMR hasn’t received an increase in its Medicaid reimbursement rate in several years. Harrell raised the concern that with the contract expiration date so close, if the Council derails the negotiations by helicoptering in three weeks for the deadline, the city may be faced with a lapse in ambulance service come September. In the end, the Council voted 6-2 to hold the resolution for a week over Sawant’s protests (Juarez was absent; Sawant and O’Brien voted against holding it). Sawant made a big deal today out of the fact that the city isn’t enforcing the competitive compensation provision of the existing contract; however, her resolution doesn’t press the city to enforce it, nor does it request the new contract to create any new enforcement mechanisms. Expect that, and other changes, to be put forward as amendments next Monday when the resolution comes back up for a vote. The second bill that Sawant introduced today is an ordinance attempting to “save the Showbox” by extending the boundaries of the Pike Place Historical District to include the building. That would put both the structure and use of the site under the control of the Pike Place Historical Commission, which must approve all construction, remodels, and new businesses within the district. The commission could deny the tear-down of the Showbox and the building of a new 440-unit apartment tower as developer Onni has proposed. Onni has submitted the Showbox to the Landmarks Preservation Board for consideration, but the board has rejected the building before because of substantial remodels in its past; even if it did approve landmark status, that would only protect physical aspects of the building and would not protect its use. The Historical Commission, on the other hand, gets to approve uses as well. Sawant is looking for a quick solution, because according to the Department of Construction and Inspections (SDCI), Onni’s development proposal could become “vested” under the current laws and restrictions for the site within the next few weeks, so the opportunity to make a meaningful change to those rules is short. This is exacerbated by the fact that the Council is about to recess for two weeks. So she proposed introducing the ordinance today, referring it directly to the full Council (skipping the committee process), and voting on it next Monday. But once again, Sawant’s colleagues didn’t feel comfortable rushing it through. Johnson in particular felt strongly that extending the historical district deserves more than just one Council meeting, and pointed out that Sawant’s proposal for extending the historical district boundaries captures several buildings, not just one. Sawant countered that she would have been fine with just extending the boundaries for the Showbox, but that city staff had told her that the Historical Commission had already been receiving inquiries over the past few years for extending the boundary to include other properties. 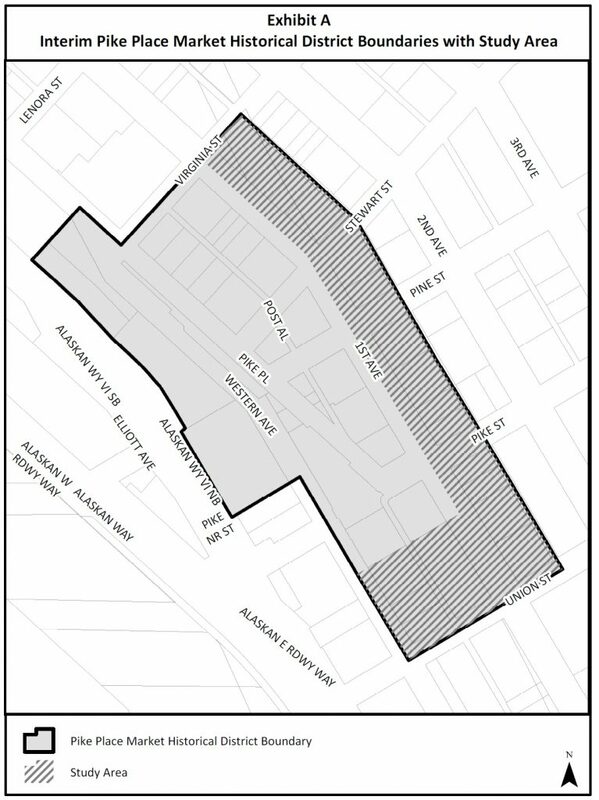 In fact, it expands the area by over 50% by adding an “interim study area,” to “allow the City to consider whether and to what extent to expand the boundaries of the District.” The study area boundary expansion would expire after two years if it isn’t made permanent. The ordinance also notes that the Historical District ordinance is legislation that is not subject to the referendum process. For Sawant, this is a benefit: it allows for potentially putting a halt to the demolition of the Showbox without a chance for voters to suspend it. But to many of her colleagues, it’s one more reason to walk the bill through slowly to ensure that they don’t overreach. The Historical District was formed in 1971 by voter initiative. 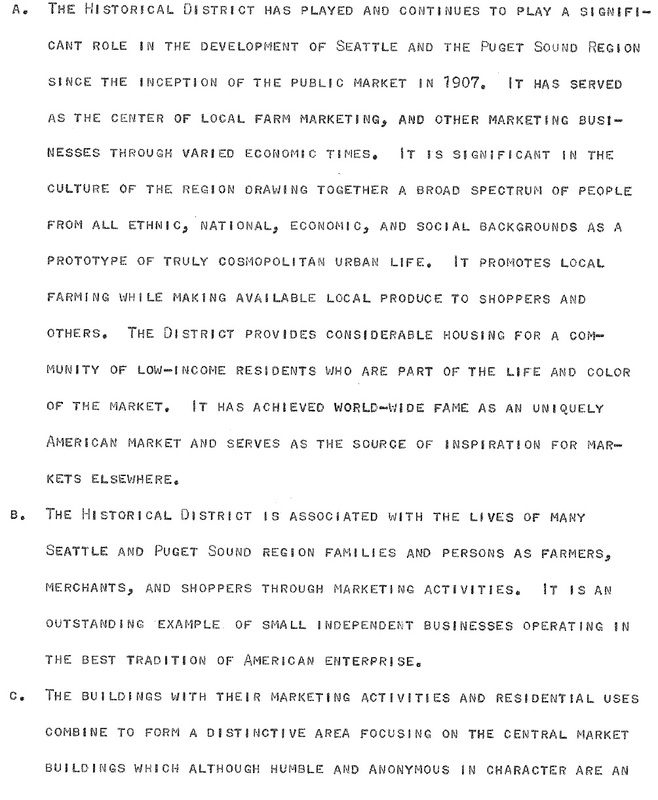 After years of slow decline, Pike Place Market had seen better days, and as part of an urban renewal project it had been proposed to tear down much of the Market, architect Victor Steinbreuck organized the campaign to “Save the Market” that led to the vote and the subsequent creation of the district. 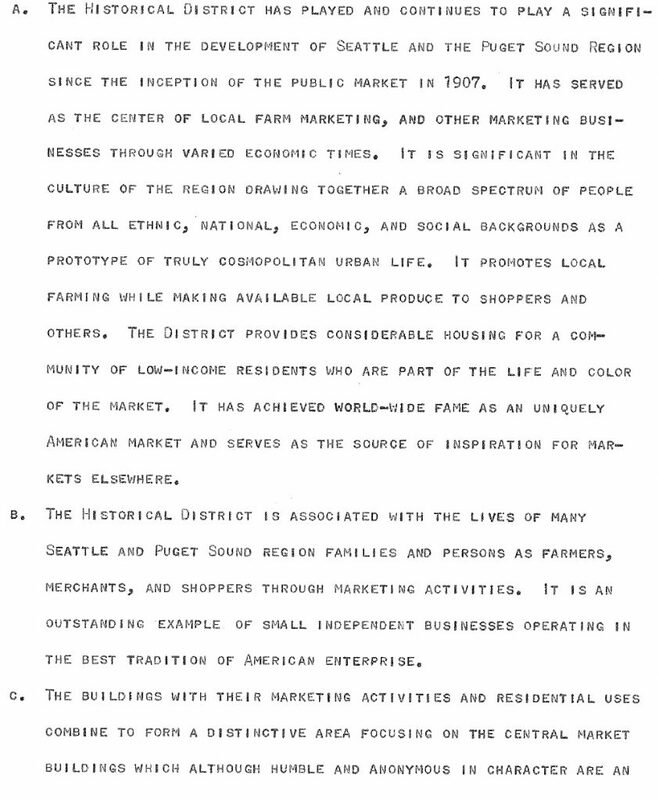 While there’s room for debate here about the extent to which cultural and entertainment spaces can be shoe-horned into the criteria, this section leaves little doubt that the main focus of the Market Historical District is to foster the marketplace, local farming, and small independent businesses — and a building structure designed to house those businesses. 2.1.1 A place for farmers to sell their own produce. 2.1.2 A place for local shoppers to do their food shopping. 2.1.3 A place where persons with low and moderate incomes can find affordable food, goods and services, and residences. 2.1.4 A widely varied shopping area with a diversity of many small, owner-operated specialty businesses. (a) First priority for sale of used goods, affordable daily necessities, or repair services, particularly for District residents and low-income shoppers. (b) Second priority for sale of flowers and plants. (c) Third priority for sale of seller-made arts and crafts items. (d) Fourth priority for sale of hard to find goods such as seasonal, ethnic or those not readily found in the greater Seattle area. (e) All other retail uses. In order to preserve the Market’s tradition of “meet the producer,” all businesses shall be operated with the owner involved in daily management and financial operation, including regular on-premises presence of the owner involving direct customer contact. Businesses with an ownership structure other than sole proprietorship, including non-profit organizations, shall designate an individual who shall be on the premises regularly and is responsible for the daily management and financial operation of the business and for on-going compliance with these Guidelines and with the terms of applicable Certificates of Approval. Except for a business that originated in the Market and whose owners or controllers later opened stores outside the Market and except for non-profit organizations, the designated individual must have an ownership interest in the ownership structure of the business. Business owners shouldn’t own or control similar businesses outside the Market. The Commission may deny an application that otherwise meets the Guidelines if the owner or the business entity has an ownership interest in or controls a similar business outside the Market. Franchise ownership and chain operations especially are not allowed in the Market. This Section 2.6.8 does not apply to businesses that originated in the Market and whose owners or controllers later opened another location or locations outside the Market. In the interest of maintaining the Market as a collection of small businesses, the maximum commercial area of any one business shall be limited to 2,000 square feet unless there are exceptional circumstances. The Showbox is none of those things. It is run by AEG, a massive corporation that runs several venues in Seattle (plus Bumbershoot, and it will run the renovated Key Arena concert business as well) on top of dozens of other locations around the world; its local management have no significant “ownership interest” in the company; and the Showbox is much larger than 2000 square feet. But on top of all that, the Commission’s certificates of approval are non-transferable: even if the Showbox were “grandfathered in” to the Market district, if it every changed hands then the new owner would need to apply to the Commission for permission to run the business. 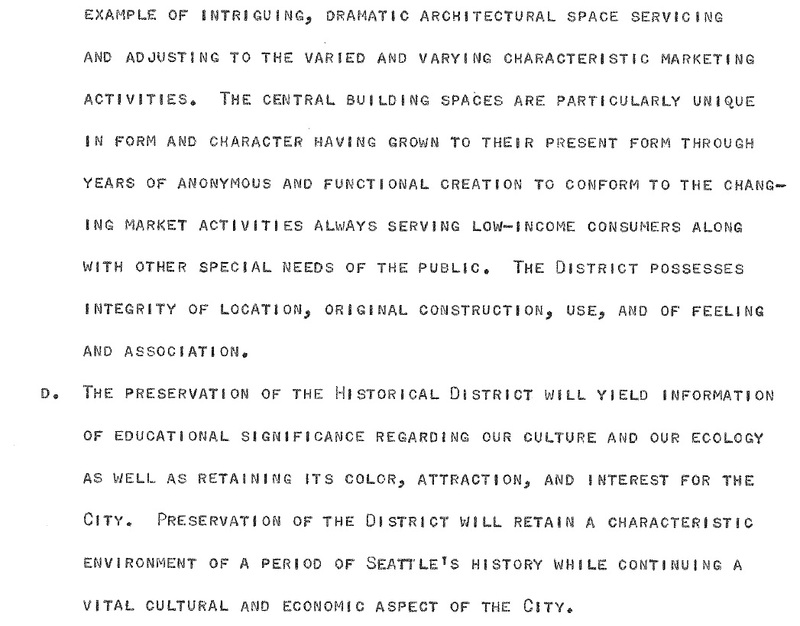 It’s very clear that the mission, structure and guidelines for the Pike Place Market Historical Commission are incompatible with a business like the Showbox. None of this implies that the Showbox isn’t worth saving; rather, it simply points out that pulling it into the Pike Place Market Historical District is a poorly-conceived way to go about it that is likely to backfire. It’s admirable that Sawant is looking for creative options to meet a policy goal, but this one isn’t well thought-out — and certainly shouldn’t be rushed through. At today’s Council meeting, Sawant and her colleagues reached a tenuous compromise: the ordinance was referred to Council member Bagshaw’s committee, which handles landmarks and historic districts, but they committed to consider it in a committee meeting this week (most likely the scheduled Wednesday meeting) and report it back to the full Council next Monday for a potential vote before the Council goes into recess. Baghsaw and her staff were already hard at work this afternoon in trying to schedule representatives from SDCI and the Office of Neighborhoods as well as the Pike Place Historical Commission. They will doubtless want to also consider what it would mean for all the other adjacent properties that would get swept into the Historical District. Both of these bills will likely be in front of the Council again next Monday. Thanks for your report. Hard to get through most of the theatrics and understand the nitty gritty of what is really going on. Thanks for the suggestion and the link. ECB’s article is excellent and strongly encourage people to read it. If you want to understand why rent is so high, just watch what the SCC is doing in response to the plan for a high-rise to go up atop the showbox. Affordable housing might be defined as housing for $100 or $200 per square foot. But in Seattle, where just the dirt is going for $500/square foot, you quickly understand that you must build UP so that many families can share the cost of that dirt. Thus, high towers are inevitable in megacities. Look at Taiwan, Tokyo, etc. It’s the only way to make living affordable. The first tall tower built will go to serve the rich. But as more towers rise, the target families will have lower and lower incomes as builders look to grow their market. In the end, if you want affordable housing in your city, what you are really advocating for is high rises. And lots of them. You cannot have affordable housing without them. Full stop.